Migrants from the Middle East have been making a contribution to Australia's prosperity since the 1800s, when Afghan cameleers provided delivery and transport services to outback areas. Many small settlements would not have been able to survive without the supplies brought to them by the Afghans and their camels. Conflict across the Middle East has resulted in Australia's latest wave of migration. Find out why people from Middle Eastern countries are coming to Australia, and how they are contributing to the nation's business and cultural life. 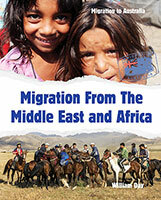 Read about the upheavals many of them have endured and the conditions which led to them leaving their homelands.